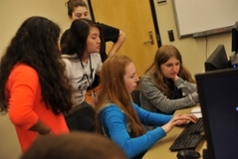 The Computer Science Department and the College of Science at Purdue University have endorsed a special collaboration between university computer science students and after-school technology clubs for high school-aged girls. The Mentors for Aspiring Girls in Computing (MAGIC) program attempts to increase interest in technology career paths among young women through the creation of safe and positive learning environments, the use of relevant CS activities for instruction, and near-peer mentoring to encourage future success. The MAGIC program currently addresses computer programming through a variety of activities including generative art, games, artificial intelligence, app development and computer security. 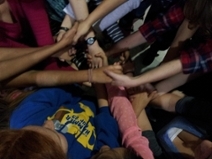 This service learning group works with four Indiana high schools and serves about 40 students on a weekly or bi-weekly basis. If you are interested in learning more about the MAGIC program, or would like to learn more about how to get your school involved, please contact Phil Sands (psands@purdue.edu). We also invite you to connect with us through our Facebook page, and follow us on Twitter. Thanks to all the Corporate Partners for their continuing support of our program!